Sask DOH (Department of Highways) and Transportation is undertaking new highways in bridges around the province. Most Notable is the P.A. (Prince Albert) Bridge study for Twinning of the Diefenbaker Bridge, as well as the West Regina bypass, and the St Louis Bridge across the Noth Saskatchewan River which carries Hwy 2. 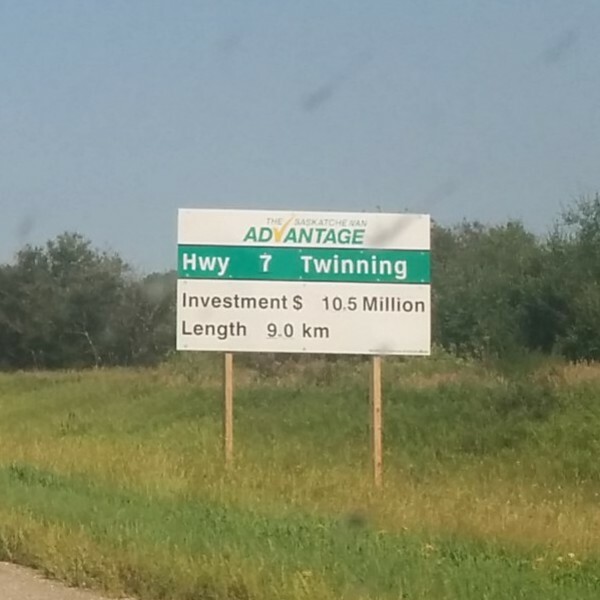 DOH is also twinning Hwy 11 north of Saskatoon to P.A. as well. This is much needed as this route has limited passing zones, heavy truck, and communter traffic between the cities. Prince Albert is a heavy forsterty and mining community. As well as becoming a Bedroom community of Saskatoon. DOH is also twinning Hwy 11 norht of Saskatoon to P.A. as well. This is much needed as this route has limited passing zones, heavy truck, and communter traffic between the cities. Prince Albert is heavy forsterty and mining community. As well as becoming a Bedroom community of Saskatoon. I drove that route last summer. Lots of progress on the twinning. I was pleased that most of the newly-twinned segments were posted with a 110 km/h speed limit, even with occasional at-grade crossings. Less welcome was the lousy condition of the primary highways in some northwestern parts of the province's populated areas, like around the junction of routes 21 (unpaved) and 55 (heavily torn up due to construction). Route signage was poor, and I accidentally drove past the turnoff for route 21 into Alberta (much better pavement) before I realized my error. 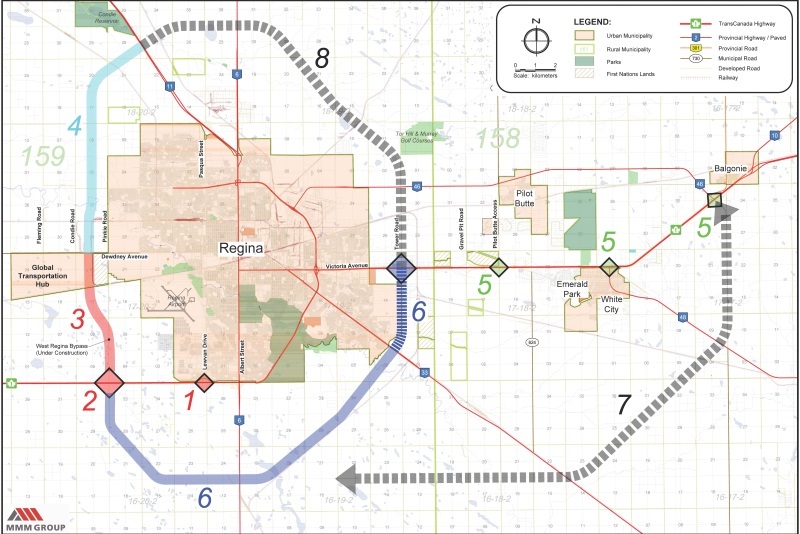 Sask DOH has on its web site a study for a South Regina Bypass. I have a link to the posting: http://www.highways.gov.sk.ca/SouthReginaBypass This one looks interesting. I know for years Regina has been looking for an alternate route for TCH-1 (Victoria Ave) heading east from Ring Road due to the build up of big box retail along this corridor. The study looks as though it will bypass Victoria Ave as well as the Southern portion of Ring Road as well. The last time I was through Regina, most of the cities development both industrial and residential, were in the North West and North East of the city. This plan indicates residential development to the south of Ring Road. Has there been any movement on the Hwy 1 portion of the Regina By-pass? It looks like the western by-pass road is going to be built in the next few years, but nothing is underway yet for the TCH portion itself. Is that indeed the case? Wow, my mouth dropped at that projected route. Good on Saskatchewan and Regina for getting this going. Acually, this seems kind of far out for a city that size. Are they repeating Winnipeg's mistake? 1. I don't think so. Winnipeg only has the one route around it. Regina would have two. 2. Winnipeg's problem, after having gone there, is a lack of decent routes in and out of the city centre. It's nothing good signal progression couldn't solve. 3. On the south side of Winnipeg, at least, the development is at the bypass in some areas, and passes it at MB-75 (that development seems to be much older). I would agree that this seems a bit unnecessary. Furthermore, this doesn't solve the problem of traffic trying to get to downtown from the east on TCH-1 - the clogged traffic through the big box retail east of Ring Road will still be there. It'll only get worse when the sprawl outward inevitably occurs. I don't see what problem this routing solves that a freeway upgrade of TCH-1 east of Ring Road (with upgraded major interchanges) and a western bypass does not. This looks like a dandy way to generate sprawl and make it more difficult to get to the city center. The southern dip in the route seems a complete waste. Some time back I saw a proposal for a freeway extension off the Ring Road in the south that served as a continuation of the east-west section on the south side of Regina heading east, then northeast and back to the Trans Canada Highway not too far east of town. This current plan trades efficiency for unnecessary elaborateness. Regina is currently the fourth fastest growing city in Canada. Apparently they expect a lot of growth in the southern part of the city. There are also plans for another bypass further southeast of Regina. Are they planning to re-routing TCH 1 when this is done or will it stay on the same route? 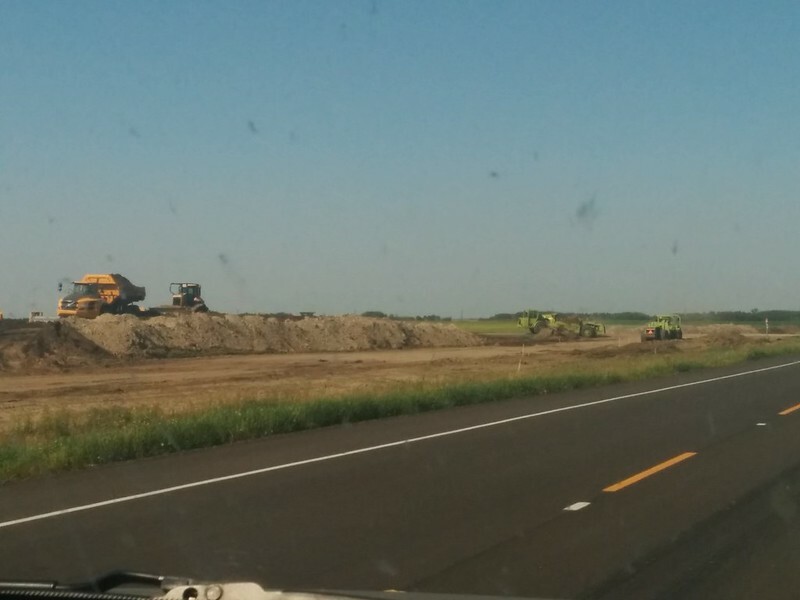 Initial work has begun on the Regina Bypass, but not without controversy about the route. 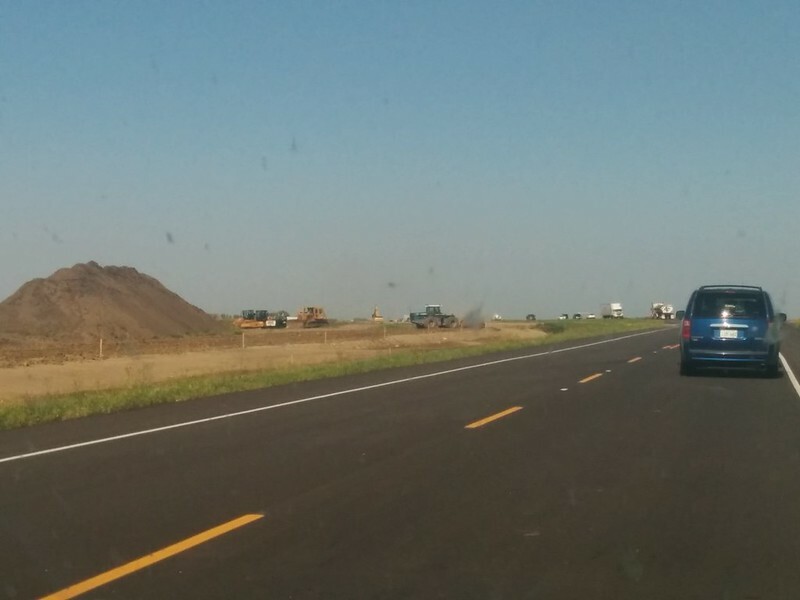 I have some photos of the Saskatchewan Highway 7 twinning project. AADT's on that stretch of highway have been increasing steadly, close to 7 000 in the section being twinned. 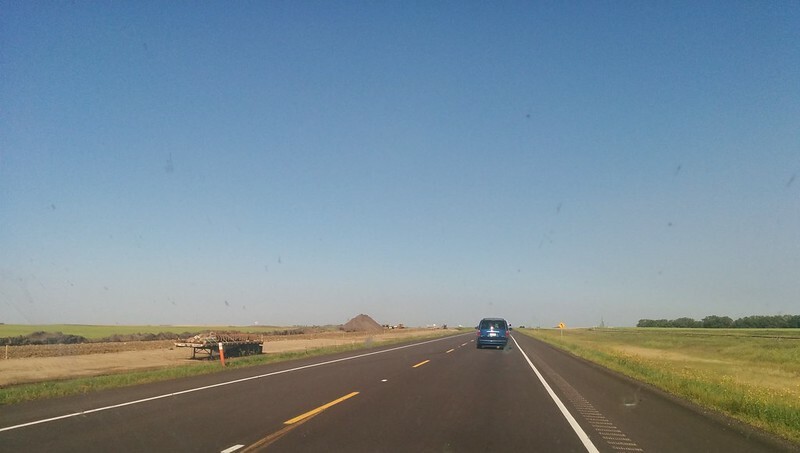 The highway will be twinned from its current location, 16 km southwest of Saskatoon, to Delisle, a town 40 km southwest of Sasktoon over the next few years. You can really see the traffic tie ups on the next one. It was a Monday evening when I was here. In terms of getting the earth ready, yes. I would say that in parts of southern Ontario that just have farmland anyway (407E), it's probably not that much more difficult. 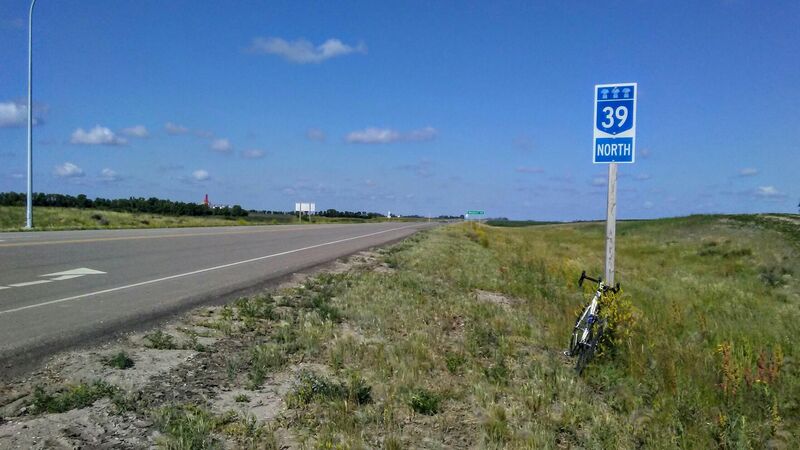 Most of these twinned highways on the prairies look like quasi freeways to me, with an even higher speed limit than full-blown freeways in Ontario and Québec. From what I've seen there are very few traffic lights on twinned highways outside cities like Regina or Saskatoon. Judging from street view and Google Earth there seem to be only two traffic lights between Estevan and Regina (both in Weyburn). That corridor will also be twinned to four lanes. I think expressway explains the twinned highways more. A few traffic lights scattered, and many stop sign level at-grade crossings. Most rail lines are underpass or overpass. The Trans-Canada in Regina still has about 5-6 traffic signals. I really wish that part was fixed up, but I guess with the new bypass being built around the city, it should make traffic better on that side. Manitoba (in part of population I guess) has many more traffic lights on the Trans-Canada than Saskatchewan. That being said, work is apparently being done upgrade sections west of Winnipeg, including the installation of four new overpasses. One will be over the Yellowhead (Highway 16) and the Trans-Canada. I haven't seen any work yet though, so I'm starting to wonder if it got delayed or cancelled outright. There is also the Perimeter Highway in Winnipeg that consists of many traffic lights; too many for me to count. The whole thing should be upgraded to freeway IMHO, but I know that would cost quite a bit. Not to mention the fact that people who live there (AKA me) don't use the highway very often. With expansion though (there are new houses that keep creeping closer to the highway), I could see it happening in 20 years. EDIT: Yup, cancelled outright. Good ol' Manitoba. The Highway 1 / 48 interchange in White City opens to traffic 'within a day'. With the other recently completed interchange at Balgonie, this essentially creates a 7 kilometer segment of de-facto freeway from White City to Balgonie, as there are no access points to Highway 1 between those interchanges. 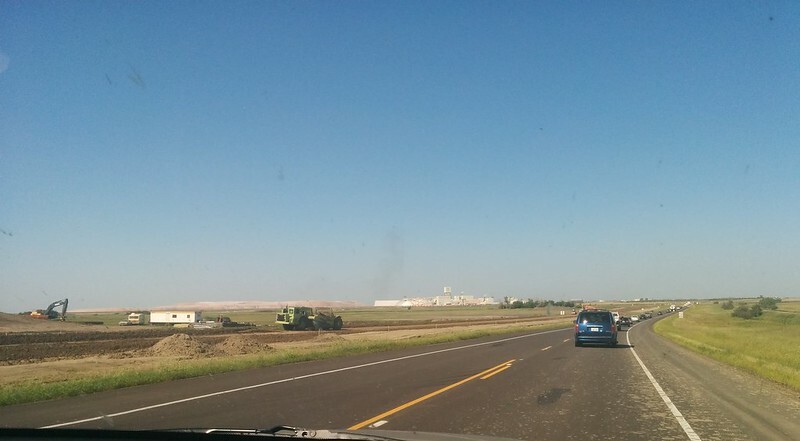 It is part of the Regina bypass project. The interchange is now open. The nearby Pilot Butte interchange will become a DDI. It will open 'later this year', making it the second DDI in Canada. I was looking at the Estevan Truck Bypass; Google has it marked as Hwy 39A but I haven't seen it verified anywhere else. Does anyone know if they bypass is signed as Hwy 39A? Interesting, thank you! Do you recall if the former (city) route was still signed as SK 39 or was it changed? Edit: Nevermind, I see on MapQuest and Bing that its SK 39A (Google doesn't show it). Thanks!